In spite of its promise to NATO to help fight the Islamic State, Turkey will not take part in combat operations against militants and will refuse to allow any US-led coalition to attack jihadists in neighboring Iraq and Syria from its air bases, a government official said Thursday. Turkey is the only Muslim country in the coalition of 10 countries who agreed to fight IS at the NATO summit last week in Wales. Turkey is a logical staging area for NATO, as IS militants control large portions of Iraq and much of northern Syria along the Turkish border. Turkey currently views itself as one of the victims of IS. Islamist militants hold 49 Turks hostage, including diplomats and children, abducted from the Turkish consulate in Mosul in Iraq on June 11. The Ankara government is apparently reluctant to take a military role in the American-led coalition against IS out of fear of aggravating the hostage situation. “Our hands and arms are tied because of the hostages,” the official told AFP. Turkey can still provide support from Incirlik Air Base in southern Turkey for logistical and humanitarian operations in any US-led operation. But the official stressed that the base would not be used for air strikes. “Turkey will not take part in any combat mission, nor supply weapons,” he said. 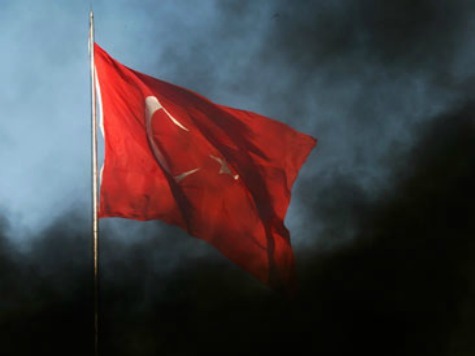 Turkey’s decision mirrors its 2003 last-minute refusal to allow the US to station 60,000 troops in Turkish territory for the invasion of Iraq from the north. Ankara then also refused Washington permission to use its air bases to attack Saddam Hussein’s regime. That decision led to a crisis between the two officially allied NATO countries. US Secretary of State John Kerry is scheduled to hold talks in Saudi Arabia on Thursday. He will attempt to rally support for military action against IS from 10 Arab nations and Turkey. The meetings follow President Obama’s Wednesday night address announcing Washington’s new strategy against Islamic State jihadists, which includes air strikes in Syria. Kerry is due to visit Turkey on Friday, according to the official. The US embassy in Ankara, however, declined to confirm the visit. Turkey has already faced strong criticism for at least indirectly encouraging the formation of the Islamic State through its support of Islamist rebels fighting the forces of Syrian President Bashar Assad.